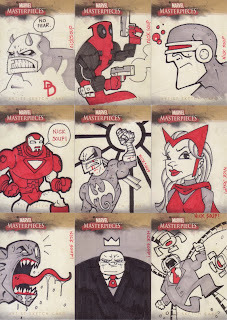 Nick Soup: Marvel Cards? Really? In other news, the Calgary Expo has come and gone once again. Best con yet. I got to speak with one of my fave artists of all time, Jim Mahfood. Really cool guy. Very talented. Also got to see Steve Rolston again, and he is also a very cool and talented guy. We swapped books. Holiday Men for Little Ghost. Lookin' good Mr. Nick. I got mine finished and I must say again, Never AGAIN wait till the last minute!! !